Sorry for not being computer savvy, but i have asked some of my friends who know more and they say that they have never heard this before "incompatible core"
I really want to have a look at this game but it won't open and when i get my PC to fix problem this is the message I get. but when i look at the specs needed my PC is more than sufficient. 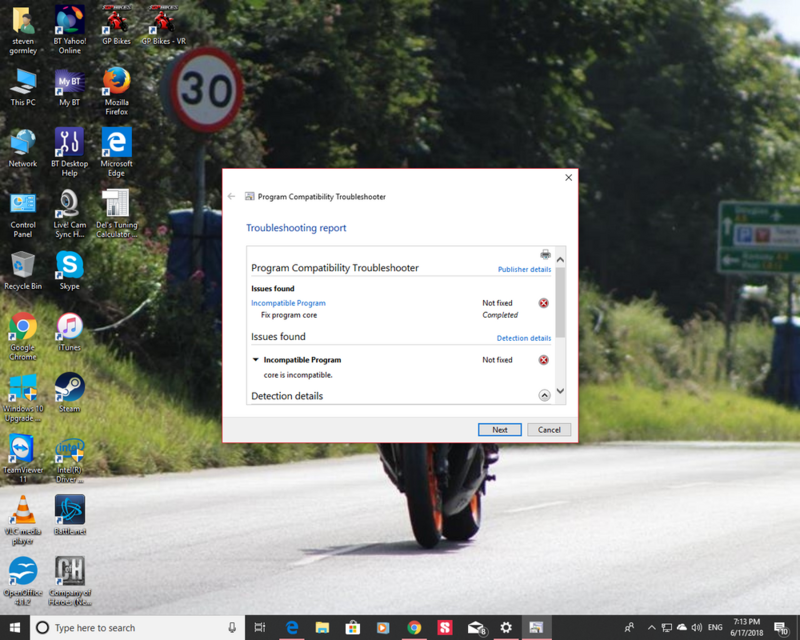 any one know what the fix is, or is it a trip to my local PC dude to get something changed out? what is the exact sentence, because i never seen a Windows message displaying "incompatible core" so, can you capture a screen ? Ok, and sorry, i fix a lot of Windows 10 but never seen that before. And i don't have any machine under W10 at my office (6 W7 and 2 Linux). But, lots of guys have W10 in here so they might encounter this issue too, lets see. Edit : BTW, Core.exe is the name of the main GP Bikes program. What were you doing before the crash happened?? think for tonight i'm going to catch up with what happened at Catalunya today, got it all on DVR thats me for the next few hours.